Jim Purtell is an activist for Vietnam veterans, particularly those who had been left behind, the prisoners of war/missing in action (POW/MIAs) in Southeast Asia. Using his songwriting abilities, he put together a CD of original songs about the POW/MIA experience. According to Vietnam musicologists Hugo Keesing and John Baky, he is the only known songwriter to have written a collection of songs about POW/MIAs. When video became popular, Jim co-produced and funded a video to go along with one of these songs (“The Waiting Goes On”). The video, which can be found on YouTube, was shot at the birthplace of his mother in Ashipun, Wisconsin, on the very farm where she grew up. Jim also co-produced a video about his uncle’s service in Korea and interwove it with his Vietnam service. This video, also on YouTube, is called “Forgotten No More.” The song was written by Purtell and Ricki E. Bellos. He, Bellos and Al Torsiello wrote a collection of songs based on his and Torsiello’s service in Vietnam. 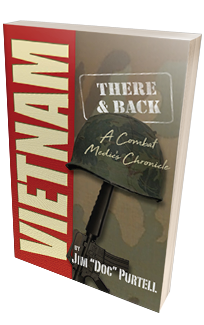 It’s called “Vietnam: There and Back” and can be found at www.vietnamthereandback.com. Jim also funded and co-produced a provocative video about Agent Orange. It features a Bellos/Purtell song called “Dear Agent Orange.” This video can also be found on YouTube.